Forever Fab: A look at what 55 years of The Beatles and their music has meant to our area, the ... . Beatles Radio: The Beatles, Solos, Covers, Birthdays, News The Fab 4 and More! 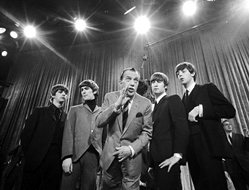 It was 55 years ago today that The Beatles went on “The Ed Sullivan Show” to play. And to further paraphrase the title track of the British band’s “Sgt. Pepper” album, they’ve never gone out of style and they still manage to raise a smile. The Beatles’ performance drew 73 million viewers, a record at the time, and came three months after the assassination of President John F. Kennedy shattered the nation. “The Beatles came along at just the right moment,” says Paula Bishop, a musicologist and professor at Bridgewater State University. The band became a worldwide phenomena with the help of mass media, a growing rock ‘n’ roll industry and youth market with money to spend on records and other Beatles memorabilia. But Bishop said the band’s lasting popularity is also due to their talent as musicians and songwriters. They wrote, recorded and performed their own songs, paving the way for others to follow suit. Most stars at the time performed songs written by others.